SaaS is a software delivery method that provides access to software and its functions remotely as a Web-based service. Software as a Service allows organizations to access business functionality at a cost typically less than paying for licensed applications since SaaS pricing is based on a monthly fee. Also, because the software is hosted remotely, users don’t need to invest in additional hardware. Software as a Service removes the need for organizations to handle the installation, set-up, and daily upkeep and maintenance. 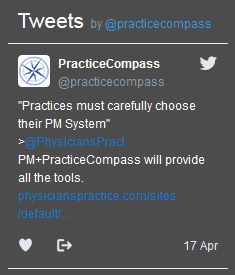 How can PracticeCompass help my practice? PracticeCompass is an all-in-one online software platform that takes the technical expertise and worries out of having software solutions running your practice. Simple on-demand software applications that work over the internet are remotely hosted and connect your practice to powerful applications that can assist with patient acquisition programs, tracking marketing tactics, managing your staff, patient relations tools, and an industry changing VoIP phone system and call center service. Do you have to be a technology person and/or an expert to add the system to my current practice setup? No, and that is the beauty of our platform. Anyone with a computer, high-speed (cable modem, DSL, fiber) internet connection can sign-up for a monthly subscriber plan and be operational within an hour. What do you share in your “Demo” presentation if I would like to see a demonstration of your system? Our “Demo Trial” is a way for our prospective customers to see the capabilities of our software first-hand. You will have an online screen sharing demonstration via internet with a PracticeCompass representative which will walk you through each of the amazing practice business enhancing tools and solutions. Why is there a monthly cost and why can’t I buy the system outright? The platform pricing & plans are designed to provide support for your practice at different levels with different features. We have created 3 tiers to help you get started and move-up to other levels of service as your practice grows, or you may want to utilize all we offer at once –the choice is yours. The pricing structure is for accessing our web-based software and hosting costs. Subscribers use their browsers to reach the applications within their service plan and monthly subscription. The advantages are no upfront costs, long term commitments, technology training concerns, security risks, and update schedules to maintain. I am very interested, how do I get started? • Request a Demo via our website. We will call you back to schedule a demonstration at a time and day most convenient for you.